Previously available on Argo, this recording of works dating from the mid-1970’s was re-released to mark the composer’s 70th birthday. 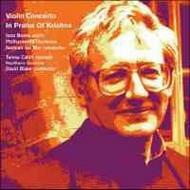 The Violin Concerto is a fundamentally lyrical work reflecting the David Blake's response to his first visit to Italy. In Praise of Krishna is a setting of religious poems of the Bengali Vaishnava sect describing a young woman’s love affair with the god Krishna; Blake responds to the powerful sensuality of the poems with an exotic and beautiful language of his own. The disc features Iona Brown, for whom the Violin Concerto was written. Edward Greenfield said of the original Argo release: “a coupling of two works which in a lyrical post-Schoenbergian style communicate with a welcome warmth … It would hardly be too much to say that Blake’s Violin Concerto … stands in the great line of British violin concertos from Elgar through Walton and Britten”.